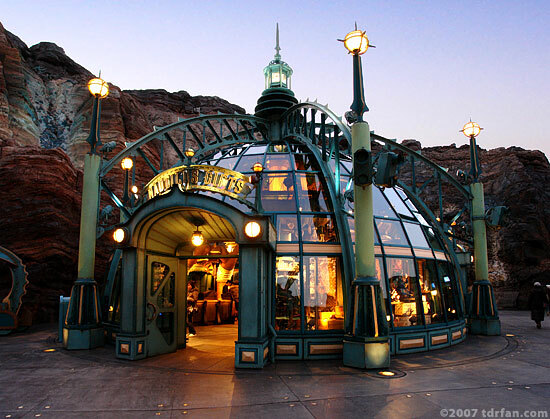 There are a couple of small souvenir stands in Tokyo DisneySea that are contained in unconventional buildings, and Nautilus Gifts is one of them (the other being Discovery Gifts in Port Discovery). A retro-futuristic steel structure with glass pane walls, this shop looks bigger on the outside than it is on the inside. Here you'll find some unique souvenirs and collectibles. Many fit the theme of Mysterious Island, but you will also find some non-Disney, science fiction, and nautically-related items as well. There is some neat stuff here that you won't find elsewhere in the park.